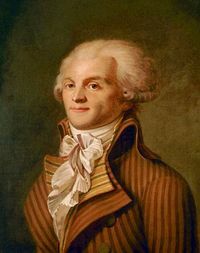 Maximilien François Marie Isidore de Robespierre was a French lawyer, politician, and one of the best-known and most influential figures of the French Revolution. As a member of the Estates-General, the Constituent Assembly and the Jacobin Club, he advocated against the death penalty and for the abolition of slavery, while supporting equality of rights, universal suffrage and the establishment of a republic. He opposed war with Austria and the possibility of a coup by La Fayette. As a member of the Committee of Public Safety, he was instrumental in the period of the Revolution commonly known as the Reign of Terror, which ended a few months after his arrest and execution in July 1794. He was a capable articulator of the beliefs of the left-wing bourgeoisie. He was described as being physically unimposing and immaculate in attire and personal manners. His supporters called him "The Incorruptible", while his adversaries called him dictateur sanguinaire (bloodthirsty dictator).